It is a very busy time at the shelter! Last week we received 11 new dogs rescued from an overcrowded California shelter, and those dogs added to the ones already at the shelter ... well, let us just say we have more great dogs to adopt right now than we have had for a long time! Some of the dogs have already been adopted, but there are still others awaiting their forever homes. We have terrier mixes, Chihuahua mixes, and little “Heinz 57” mixes as well as larger dogs, such as Sasha, who is a very pretty Cattle Dog. There are also some nice pittie and shepherd mixes. 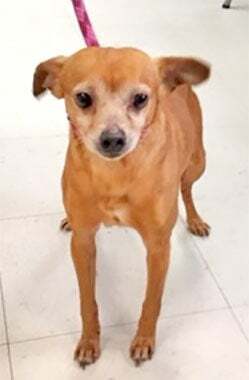 “Noah” is a very sweet little six-year-old tan and white Chihuahua mix who came with the group last week. He loves people and gets very excited and “chatty” when anyone stops by his kennel. We are considering him special needs because he has a heart murmur and has an unknown future. Currently he is active and doing well. Noah would do well in a quiet home, and would make a wonderful companion for an older person or couple. His adoption fee is only $50. Please come and meet him if you think you might be able to give him a good chance at a better life. We have also received some very pretty and social kitties. Three of them came from the same living situation and are beautifully marked tabbies with longer hair. All of the cats come fully vetted — spayed or neutered, vaccines, tested for FIV/FELV, and flea-treated. Kitten season is just around the corner, and it can be hard for the adult cats to compete with cute kittens in the adoption arena, so we are hoping many of the wonderful adults will be adopted soon. While kittens are very cute, adult cats are usually better behaved, more affectionate, and have developed their individual personalities so it is easier for an adopter to determine if they would be a good fit for their homes and family. Also new we will be open longer hours beginning on Thursday, April 4. Starting on this date, the shelter will be open from 11 a.m. to 6 p.m. These extended hours will hopefully allow working folks or families with children extra time to find just the perfect pet! Adoptions require approval of an adoption application. Applications are available at beachpets.com. Email the completed form to spchs330@gmail.com. Prospective adopters can also fill out an application at the shelter. SPCHS Shelter is at 330 Second St. NE, Long Beach, WA 98631 (P.O. Box 101) 642-1180. Open Tuesday through Saturday from 11 a.m. to 6 p.m.